To produce 3D content, a range of new 3D production equipment is required to combine images from the two cameras, representing the Left Eye and Right Eye. One of the key monitoring elements is to ensure that the two cameras are well balanced and matched to create good quality 3D effects without causing discomfort for viewers. 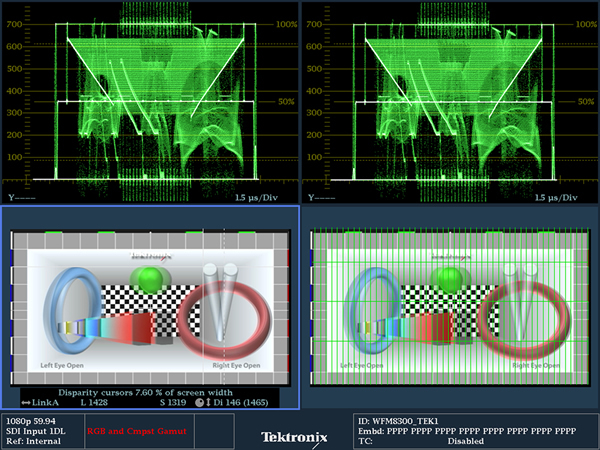 Tektronix has introduced several new displays for 3D production work that assist production teams who are determining the differences between the Left Eye and Right Eye images. The 3D Difference Map Display can be used to effectively detect disparity between the Left Eye and the Right Eye images during camera setup (alignment) of 3D production or 3D post production. The Anaglyph Display allows users to identify parallax (3D depth) of various objects within the 3D video image. The Checkerboard Display helps the user (such as a stereographer or a colourist) identify any differences in luminance levels (brightness), focus, and various colour characteristics between the Left Eye and the Right Eye images. For monitoring of depth of various objects within a 3D image, a Disparity Grid can be overlaid over various 3D picture displays. A Disparity Cursor is also available for precise measurement of the disparity between the left eye and right eye of an object within the image.